HÀ NỘI — Ride-sharing services, which allow two or more passengers to share a single trip, could significantly help alleviate congestion and contribute to unlocking a city’s potential. The survey was conducted in Hà Nội, HCM City and seven other large Asian cities, including Singapore, Kuala Lumpur, Jakarta, Surabaya, Hong Kong, Taipei and Manila. While the population of the Asia Pacific region has grown by 50 per cent over the last 30 years, the demand for vehicles has soared by 300 per cent, Chin said. There are two solutions to adequately meet demand, including investing more in public infrastructure, which might cost over US$155 billion from 2017 to 2020. The second solution is to take advantage of the spare seats in cars, which means utilising the ride-share model as much as possible, he said. According to BCG’s survey, 10-40 per cent of future car buyers in the 10 cities studied would be highly willing to not purchase a car with more access to ride-sharing. The model helps gather more passengers per vehicle, increasing average vehicle occupancy 1.7 times. Thus, ridesharing would create greater vehicle ultilisation per km. “In San Francisco, ride-share vehicle kilometres without passengers is approximately half that of taxis,” said Chin. He added that it also helped optimise infrastructure investment timing, “some US municipalities are deferring infrastructure while partnering with ride-share firms to provide access,” Chin said. “By using ride-share, we could take 40-70 per cent of cars or motorbikes off the road, which means a reduction of over 17 million private vehicles,” he said. “We also can reduce congestion by between 50-90 per cent across cities, nearly eliminating congestion entirely in some cities,” he added. 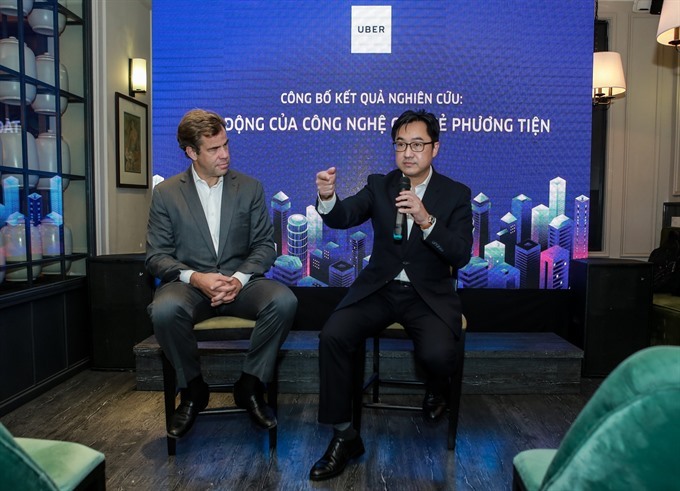 According to Brooks Entwistle, Chief Business Officer for Asia Pacific of ride-hailing firm Uber Technologies Inc, by 2030, Asia’s motorised transport emissions will be responsible for up to 31 per cent of global aggregate emissions. Asia suffers from the highest levels of air pollution in the world, with as much as 80 per cent attributable to transport, Entwistle said while quoting Uber’s statistics related to the issue. On average, every day people are stuck in traffic jams for 51 minutes in HCM City and 58 minutes in Hà Nội, he indicated. In Hà Nội, 77 per cent have missed or been late to an important event due to problem finding a parking spot. In HCM City, 68 per cent have suffered the same issue, he added. “The more people use share models, the more likely they are to use public transit, own fewer cars, and spend less on transportation overall,” Entwistle said.